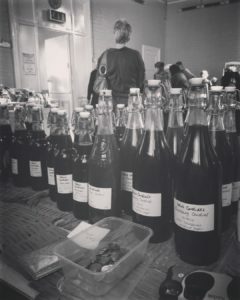 Sarah Bodman previews new book works by Déirdre Kelly and Rosie Sherwood that explore our experience of place through the use of collage and mapping. Our human experience of place is the focus of two artists working through collage, mapping and books. Meeting of the Waters – Cruinnú na n-Uiscí by Déirdre Kelly (Wild Pansy Press, 2016) proposes a new landscape structure within central Ireland, created by an interlocking of the east and west coasts. This imagined space brings the Irish Sea and the North Atlantic Ocean together in a watery mix of salt lake, with headlands and shores now in the middle of the fertile landscape. 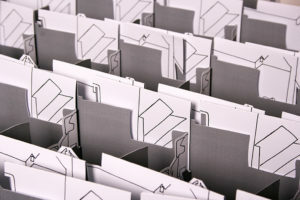 The concertina book edition of 200 was printed from an original collage by the artist, made in homage to the Czech poet/artist Jirí Kolár, known for his intricate parallel line collages or ‘picture-poems’ in the 1960s-‘70s. 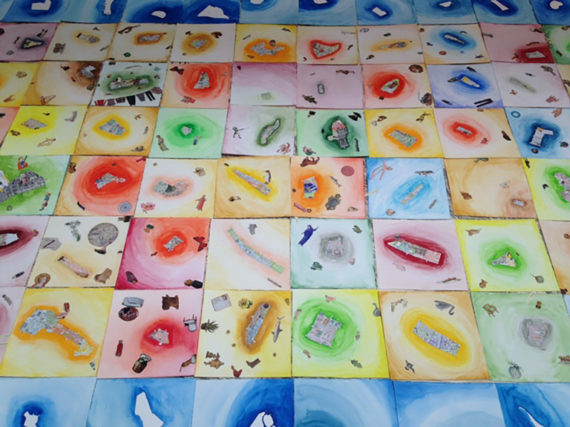 Kelly uses maps, land and water as a means to investigate and articulate the ideas of territories, place and migration, integrating visual source material from her native Ireland and Venice, where she now lives. 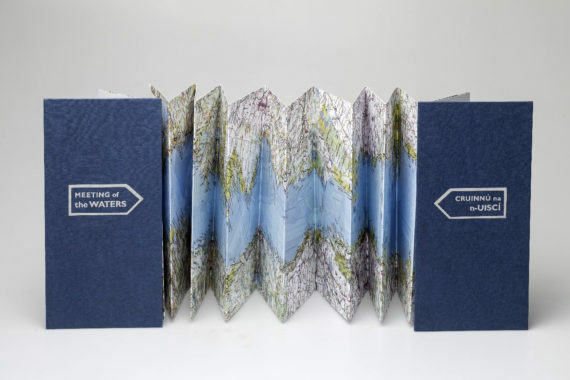 Devon-based artist and As Yet Untitled publisher Rosie Sherwood is developing a new series of bookworks based on personal memories of walking as a means of deep mapping, surveying the environs up close and as part of the wider landscape. 50.5803° N, 3.7551° W (2017) is the first iteration of Sherwood’s new project, ‘Mapping in an Ever Moving Now’. Inspired in part by a visit to the exhibition ‘Maps and the 20th Century: Drawing the Line’ at the British Museum, this particular book has emerged as an emotional response to Dartmoor. 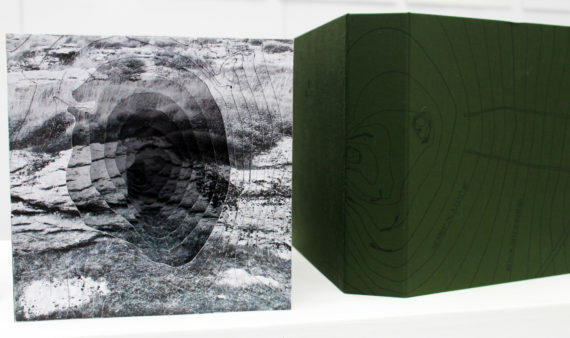 The tunnel book visually represents the simultaneous experience of both the vastness of the landscape and the nooks and crannies of the rock face at Haytor on Dartmoor’s eastern edge. 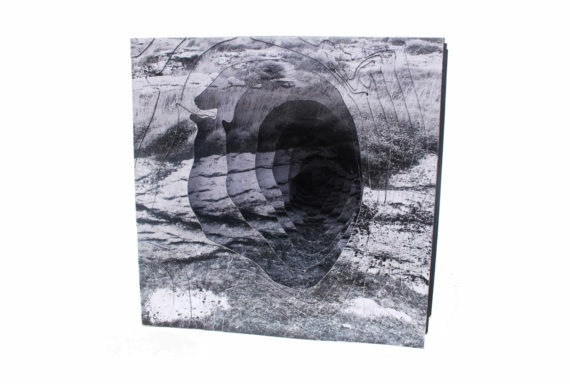 In contouring and collaging the photographic image, the tunnel book creates literal and imaginary depth, alluding to the present and our historical experience of the landscape over centuries.